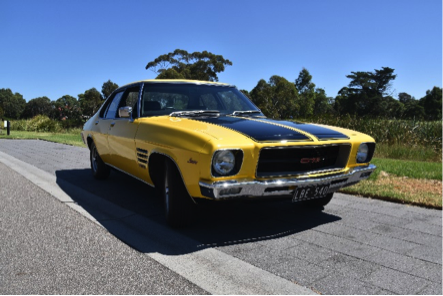 Our car started life as a silver 308ci Holden Kingswood, manufactured in Melbourne in late 1971. I have no records of who owned the vehicle except for the air conditioner warranty. 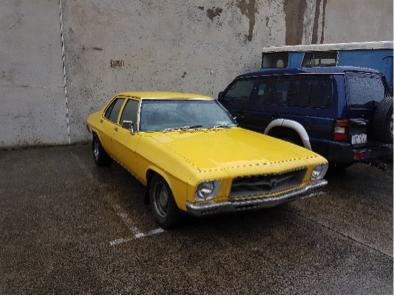 In September, last year we bought our sad yellow Kingswood from a mechanic’s workshop in North Melbourne. It was purchased by them from a family whose son moved to the UK and decided that he no longer wanted the car (Living in the UK he probably needed the money more) At the time it had wide 12 slot wheels with smooth tyres, indicators that didn’t work and THE worst number plates… SEXYHQ !! We drove off from North Melbourne on a rainy Saturday morning to deliver it to Thomastown where it would live for the next five months being tweaked, cut, rubbed and hugged while it was converted from the sad yellow taxi colour into what it is today. During the process a warranty for the air conditioner was found in the glove box. On the warranty was the registration number the car now wears. It was available and we thought it was worthy of throwing more money into the money pit to put them back on the car. The air con is now pride of place in a cardboard box in the garage. Air con for the car is left and right windows much to my wife’s disgust !!!! 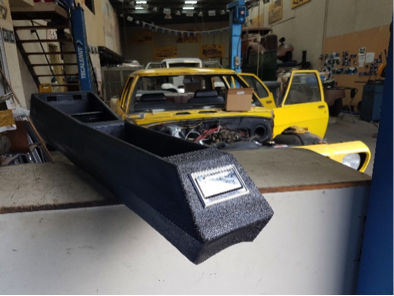 I became an ardent convert to ebay, Rare Spares and Resto country and the odd wrecker to find parts that were fitting to the process. Wheels were sourced, bought and delivered. Sand blasting and painting brought them back from the unloved; dashboards, gauges, flutes, and on and on it went. Whenever I thought the sky was falling the maestro in charge of the conversion would say, ‘it shouldn’t be a problem’ and it never was…………….. for him. Me however was left to wonder.. HOW ? My console… A trip to the wrecker and the sorry broken down console bought. 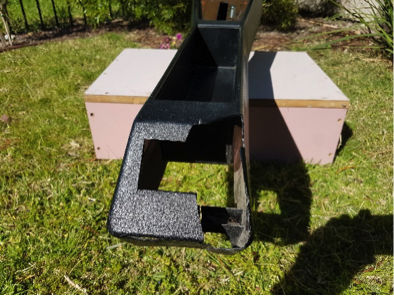 Then it was off to Monbulk to a plastic repair man who put it all back together. A couple of tins of ripple paint and a million dollar look. Unfortunately, the smell was overpowering. 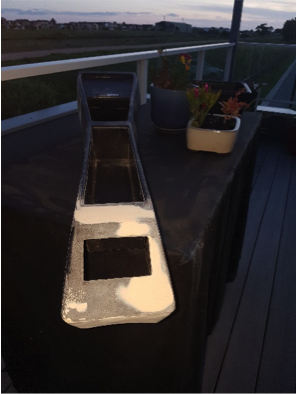 It is now rubbed back and has a cover of matt paint and is far more user friendly. Eventually collection day came. Saturday finally arrived, much to my wifes joy; I’m a five year old at heart and ‘Is it Saturday yet’ wears thin when I’m asking from Monday night !! Oops, hold the thought. The factory across the road caught fire and the road was closed. Oh well, next week. Another week of ‘Is it Saturday yet’ and off we went. We collected the car and headed for home. Appreciative thumbs up and smiles as cars and bikes pass us. Then one driver urgently tells us we are blowing smoke. Hmmm pink viscus liquid is dripping from under the car on to the exhaust. BACK to the workshop and it’s the gearbox leaking. Rookie mistake. Steering brakes and everything EXCEPT the gearbox was refurbished. So it was another week of ‘Are we there yet’ for my wife and finally we were able to collect the car and bring it home. Friday 24 February, we finally got ‘Monty’ in to Vic roads and had him registered. So here we have our 1971 Holden Kingswood tweaked and moulded in to what I hope is an appropriate and proper representation of a GTS Monaro. We plan to have many happy years of motoring in our big yellow taxi that I call Monty and my grandchildren have called bumble bee.